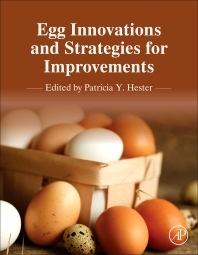 Egg Innovations and Strategies for Improvements examines the production of eggs from their development to human consumption. Chapters also address consumer acceptance, quality control, regulatory aspects, cost and risk analyses, and research trends. Eggs are a rich source of macro- and micronutrients which are consumed not only by themselves, but also within the matrix of food products, such as pastas, cakes, and pastries. A wholesome, versatile food with a balanced array of essential nutrients, eggs are a stable of the human diet. Emerging strategies entail improvements to the composition of eggs via fortification or biological enrichment of hen's feed with polyunsaturated fatty acids, antioxidants, vitamins, or minerals. Conversely, eggs can be a source of food-borne disease or pollutants that can have effects on not only human health, but also egg production and commercial viability. Written by an international team of experts, the book presents a unique overview of the biology and science of egg production, nutrient profiling, disease, and modes for increasing their production and quality. Designed for poultry and food scientists, technologists, microbiologists, and workers in public health and the food and egg industries, the book is valuable as an industrial reference and as a resource in academic libraries. How much space do hens need in large enriched cages? Do pullets need enrichments too? What does the future hold with regard to reducing egg cholesterol? Phosphatidylcholine content of eggs: a new concern with regard to cardiovascular disease pathogenesis? Introduction: is iodine deficiency still a worldwide problem? Vaccination or chemotherapy in egg laying stock?